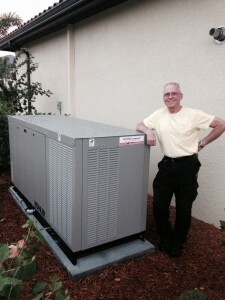 Kohler Generators was a great choice for Larry! He did his homework and made the decision to purchase a Kohler Generator. Based on West Coast Generators knowledge and experience, Larry’s budget, space and the fuel source, a Kohler 38RCL was the right choice. Kohler Generators come with a 5 year limited warranty and are built to last! Larry’s installation was quick and painless with no problems at all. You can see from the picture that Larry is super happy and will be smiling all through the next power outage. Larry was a great customer to work with and we were very honored to work for someone who served in our Armed Forces! Thank you Larry for your service to our country! If you would like to learn more about West Coast Generators and what we could do for you, send us an email or give us a call. Thanks for stopping by. Leave us a comment and/or share this post!